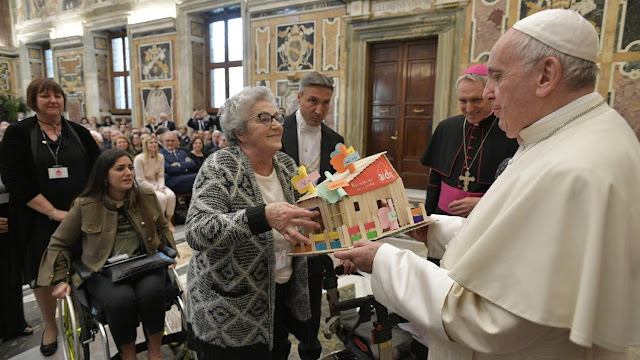 Catholic News World : Pope Francis speaks on Organ Donation "...through information, awareness and your constant...without risk or disproportionate consequences, in living donation, and all the organs after their death." Pope Francis speaks on Organ Donation "...through information, awareness and your constant...without risk or disproportionate consequences, in living donation, and all the organs after their death." I am pleased to welcome all of you, volunteers of the Italian Association of Organ Donors (AIDO), gathered here representing thousands of people who have chosen to testify and spread the values ​​of sharing and donation, without asking anything in return. I cordially greet you and thank your President, Dr. Flavia Petrin, for the words with which she introduced this meeting. The developments in transplantation medicine have made it possible to donate organs to save other human lives after death, and in some cases even in life (such as in the case of the kidney); to preserve, recover and improve the health of many sick people who have no other alternative. Organ donation responds to a social need because, despite the development of many medical treatments, the need for organs still remains great. However, the meaning of the donation for the donor, for the recipient, for society, does not end in its "utility", since it is a deeply human experience full of love and altruism. Donation means looking and going beyond oneself, beyond individual needs and opening oneself generously towards a wider good. In this perspective, organ donation arises not only as an act of social responsibility, but as an expression of universal brotherhood that binds all men and women together. In this regard, the Catechism of the Catholic Church teaches that "organ donation after death is a noble and meritorious act and should be encouraged as a manifestation of generous solidarity" (n. 2296). By virtue of the intrinsic relational dimension of the human being, each of us realizes himself also through the participation in the realization of the good of others. Each subject represents a good not only for himself, but for the whole society; hence the meaning of the commitment to the achievement of the good of others. In the Encyclical Letter Evangelium vitae, St. John Paul II reminded us that, among the gestures that contribute to nourish an authentic culture of life "the donation of organs carried out in ethically acceptable forms deserves a particular appreciation - this should be underlined -, to offer a possibility of health and even life for sick people who are sometimes without hope "(n. 86). This is why it is important to keep organ donation as an unpaid free act. In fact, any form of commodification of the body or part of it is contrary to human dignity. In giving blood or an organ to the body, it is necessary to respect the ethical and religious perspective. For those who do not have a religious faith, the gesture towards the needy brothers asks to be performed on the basis of an ideal of disinterested human solidarity. Believers are called to live it as an offering to the Lord, who has identified himself with those who suffer because of illness, road accidents or accidents at work. It is good for Jesus' disciples to offer their organs, in the terms allowed by law and morality, because it is a gift made to the suffering Lord, who said that everything we did to a brother in need 'we have done to him (see Mt 25:40). It is therefore important to promote a culture of donation which, through information, awareness and your constant and appreciated commitment, favors this offer of a part of your body, without risk or disproportionate consequences, in living donation, and all the organs after their death. From our own death and from our gift life and health of others can arise, sick and suffering, helping to strengthen a culture of help, of gift, of hope and of life. Faced with threats against life, which unfortunately we have to witness almost daily, as in the case of abortion and euthanasia - to mention only the beginning and end of life -, society needs these concrete gestures of solidarity and of generous love, to make people understand that life is a sacred thing. I encourage you to continue in your efforts to defend and promote life, through the wonderful means of organ donation. I like to remember the words of Jesus: "Give and it will be given to you: a good measure, pressed, overflowing and overflowing - the Lord does not spare the adjectives here - will be poured into your womb" (Lk 6:38). We will receive our reward from God according to the sincere and concrete love that we have shown towards our neighbor. May the Lord sustain you in your good intentions. For my part, I accompany you with my humanity and my blessing. Thank you.